Why did Mass-Observation have such an intense impact? The main reason, I think, is that it is very rare to explore routine daily life in this detailed, ambitious way – to shine what one atypically appreciative newspaper article called ‘a searchlight on living’. [ix] For this is a world that we normally regard as too prosaic to be worthy of notice. The French author, Georges Perec, calls it the ‘infra-ordinary’: that part of our lives that is so routine as to become almost invisible, like infra-red light. [x] Perec spent his whole career trying to make the ‘infra-ordinary’ more visible by lavishing it with the kind of painstaking attention we normally reserve for earth-shattering events and grand passions. His book, Species of Spaces (1974), simply lists all the objects he can see in his apartment and neighbourhood. He urges his readers to do the same with the contents of their own lives, looking afresh at how streets are named, houses are numbered and cars are parked – and not to worry about whether these subjects have some pre-agreed significance. But this kind of research project is so unusual that when we read the findings – whether on the parked cars in a Parisian street or the size of the portions in a Bolton chippie – we experience both the shock of recognition and the shock of the new. This book is also about the ‘infra-ordinary’ – the unremarkable and unremarked upon aspects of our lives. I should begin by warning you that, if you profess an interest in this overlooked research area (which to a certain extent you have already done by picking up this book), you will probably need to develop a thick skin. Some people may accuse you of trying to rediscover what a certain strain of English pragmatism likes to call ‘the bleeding obvious’. I am often asked, with a certain benevolent bemusement, why I study such obscure topics as the symbolism of the lunch break, the history of crossing the road or the politics of sitting on sofas. Sometimes, perhaps while investigating a recherché fact about the prawn mayonnaise sandwich, I have wondered this myself. We expect scholars to have a specialism, a particular expertise that marks them out from non-experts – and when it comes to familiar things like eating prawn sandwiches, crossing the road or sofa-sitting, everyone is a sort of expert. But while we all experience these activities, we rarely give much thought to them, largely because they are social habits rather than individual idiosyncrasies. Working away at our office desks, sitting in meeting rooms, eating ready meals, flipping through the TV channels with the remote control – these are all part of what the German critic Siegfried Kracauer calls ‘a life that belongs to no one and exhausts everyone’. [xi] We share these habits with others but have little personal investment in them. 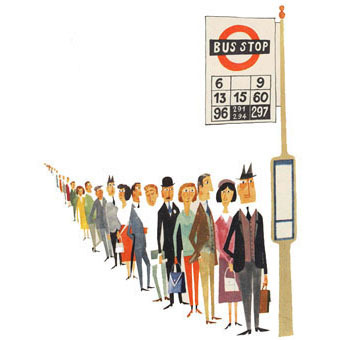 Activities like queuing and commuting cannot easily be appropriated as part of a consumer ‘lifestyle,’ one of the ways in which, since at least the 1950s, we have deliberately sought to give meaning to our otherwise unconscious daily lives by making them serve a specific self-image or creative impulse. They make up the constant, unnoticed background noise of our lives. [i] Raoul Vaneigem, The Revolution of Everyday Life, trans. Donald Nicholson-Smith (London, Rebel Press/Left Bank Books,  1994), p. 21. [ii] Humphrey Jennings and Charles Madge (ed. ), May the Twelfth: Mass-Observation Day Surveys 1937 (London, Faber and Faber,  1987), pp. 360-97. [iii] Tom Harrisson, Humphrey Jennings and Charles Madge, ‘Anthropology at Home,’ New Statesman and Nation, 30 January 1937, p. 155. [iv] Tom Harrisson, Britain Revisited (London, Victor Gollancz, 1961), p. 25; Tom Harrisson, World Within: A Borneo Story (London, Cresset, 1959), p. 158. [v] Charles Madge and Tom Harrisson, Mass-Observation (London, Frederick Muller, 1937), p. 29. [vi] Walter Hood, ‘Outing with a girl stranger, 19 April 1938,’ in Angus Calder and Dorothy Sheridan (eds), Speak for Yourself: A Mass-Observation Anthology 1937-49 (London, Jonathan Cape, 1984), pp. 39-42. [vii] Charles Madge and Tom Harrisson (ed. ), First Year’s Work 1937-38 by Mass-Observation (London, Lindsay Drummond, 1938), p. 87. [viii] Angus Calder, ‘Introduction,’ in Tom Harrisson and Charles Madge, Britain by Mass-Observation (London, Cresset,  1986), p. vii. [ix] Cassandra, ‘What were you doing at 8.57 last night?,’ Daily Mirror, 25 June 1937. [x] Georges Perec, Species of Spaces and Other Pieces, ed. and trans. John Sturrock (London, Penguin, 1999), p. 210. [xi] Siegfried Kracauer, ‘Boredom,’ in The Mass Ornament: Weimar Essays, ed. and trans. Thomas Y. Levin (Cambridge, MA, Harvard University Press, 1995), pp. 331-2.